Whilst I have covered the implications for the Scottish Economy at length in a series of articles and videos that boils down to Scotland being subsided by the UK (England) to the tune of £1600 per person per year in terms of public spending, and taking all UK government interventions into account such as building of the 2 aircraft carriers and UK central government agencies placed in Scotland that further boosts the size of the scottish public sector, then the total net subsidy to Scotland is £9 billion per year which works out £1,730 extra per person over that of every English person. Increasingly the big on rhetoric scottish nationalists inhabit a fantasy land of a case of business as usual on the day after a YES vote victory when instead September the 19h will mark the first day of the North of the Island of Britain being hit be waves of ever escalating disastrous events that will start with announcements of dis-investment from Scotland by businesses and individuals and soon followed by an exodus of higher tax paying professional workers that as Deutsche Bank warns would at a minimum plunge Scotland into an prolonged 1930's style economic depression. he chief economist at Deutsche Bank David Folkerts-Landau said "voters and politicians had failed to grasp the potential severity of the negative consequences of separation. Earlier Mark Carney, Bank of England Governor had warned that an Independent Scotland would effectively become bankrupt as it would need near TEN times the reserves that an Independent Scotland would have so as to make Sterlinglisation work, which is NOT going to happen which means that the government of an Independent Scotland is literally going to have NO CURRENCY other than that in the sterling bank accounts of its citizens that I am sure it will attempt to seize thus triggering more fright and flight! This is NOT scare mongering for the flight of capital out of Scotland and the UK is already well under way that began in June and has been gathering pace as the poll date draws near with the UK seeing a net out flow of £17 billion in August, that's three times Scotland's annual Oil tax revenues that the SNP crow so loudly about, and should Scotland vote to dismember the Island of Britain then September outflows could exceed £150 billion, more than the annual output of the whole of Scotland, and much of it panicked liquidation of Scottish assets in favour of foreign currencies such as the dollar and euro. Again it is already happening so it is not a question of it could happen. 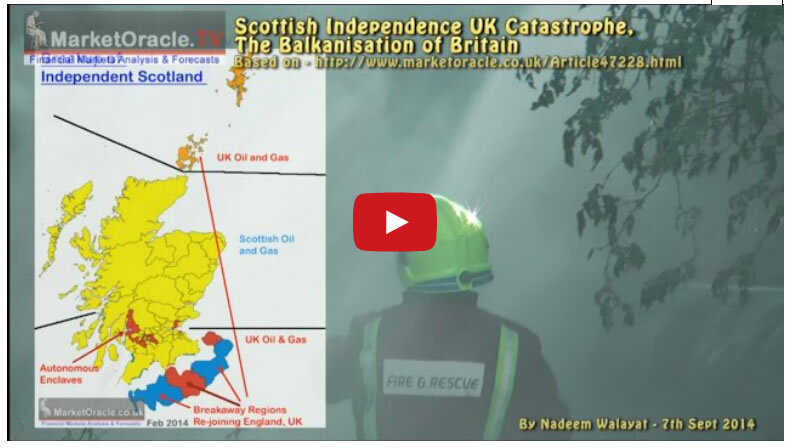 However, my recent series of articles and video has highlighted that the financial and economic crisis following independence would mark just the tip of the chaos ice-berg that would hit Scotland hard and the UK to a lesser degree as Scotland would literally be ripped apart by a chain reaction of events in reaction to the fissures that will open up across the North of Britain as the social fabric of the Island nation would start to disintegrate. Unionists have already gotten out the pro protestant anti-papacy banners that Saturday were paraded through the streets of Edinburgh by the Orange Order, one of the largest marches in 60 years as a prelude to what is to follow 'independence' as 50% of the nation reacts to finding themselves forced to live outside of the UK. The problem is that the people won't wait for committees of negotiators to arrive at orderly agreements over the next 18 months, instead people will act out of panic and fear out of manifesting financial and economic crisis that would set in motion a sequence of events that ultimately will be many magnitudes that of the Northern Ireland Troubles. For instance the Scottish nationalists appear to ignore the big elephant in the room that if they win the referendum then they will have condemned near 50% of the population in perpetuity to live outside the UK, a state of affairs that that they can longer effect democratically. Which means it won't be long before Scotland starts to fragment along Unionist and Nationalist lines with Unionist majority areas in the wake of political, economic and social chaos soon starting to demand their own referendums to allow the regions to rejoin England, UK, as had Northern Ireland beforehand. I have been warning the probability of this since February 2014, and most recently in my in-depth analysis of 7th September as excerpted below in addition to my recent video.